Sourced from Muffydavis.com. Or alternatively Jeff's LP travel blog. And when not able to do either there are menchu's. Translated as medicinal water (or possibly mineral water with high mineral content), these are spring waters with curative powers. These are found all over the country and are best appreciated heated with hot stones, so as to make them bearable. 'The Menchu Karp smells pungent and is believed to mainly cure tuberculosis, nausea, rheumatism and boost appetite. “The menchu is so effective that people even tried channeling it down to villages using pipes but failed,” said another visitor, adding that the Menchu Karp is believed to be under the guidance of the local deity, Changmey Phodhup'. 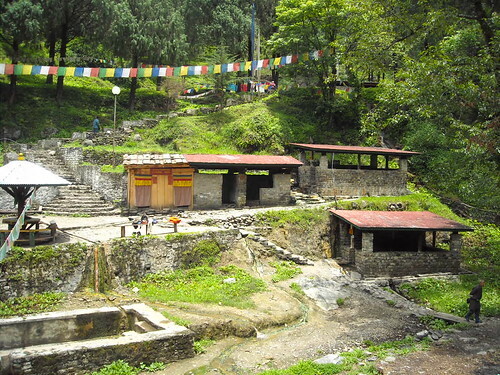 'There is also a spring water (Menchu) near Aja Chhu believed to have medicinal values. People frequent the place to bathe in the pungent smelling spring for medical purposes. It is believed to have a curative effect on 18 diseases such as tuberculosis, bodyache, ulcer and whooping cough. Located in the same vicinity is another stream called Awa Chhu. Legend has it that the stream that falls from the rocky cliff came into existence after Guru's walking stick was implanted in the rock. The stream falls on a rock basin forming a pool, where it is believed the Guru had taken bath. The pool accommodates nine people and a bath in the pool is believed to purify a person. All visitors sincerely take a dip in the pool which is also believed to be warm in winter and cool in summer'. Aja Chhu is probably the most sacred of menchu's and Kuensel has a long article on this place. A photo which was once on picasa, link seems to have disappeared. A dhotso? Left the men are heating the stones, right the women are bathing. 'he will show you with a wry smile how to disrobe and make proper use of them'. Kuensel only last month reported on the shortcomings. The gist:maybe by 2012 Gasa will be visitable. An update on Soaking in Southeast Asia refers to a bidding war by Japanese and Italians.... October 2012 mentions that the hot spring is open for business. The road seems to be on. The Bhutanese reports (24 March 2012) on the road initiative. The locals seem to be intent on the road passing near or through the hot springs area, whereas officials are arguing that they will never get the environmental clearance. In that case the road would by-pass the hot springs by 3-4 km. Other than Chuphu there are no references on the internet other than this source. Possibly because of spelling? Chuphu is much better known as Chubu. As stated above, it is located in Punakha, Chubu is often visited. 'The Tshachhu, however, lacks proper pond and accommodation facilities'. Does not look like much has changed since. 'Many great master visited this Landlocked country in different centuries. As well during 8th century, the great Ngingmapa Master Guru Padmasambhava (lotus born) visited Bhutan, subdued the evils and blessed whole corner of the valley where he also introduced Hot spring for the well being of the sentient [= responsive, perceptive] beings. So, with the strong believes, hundreds of people hiked to the particular places where they have hot spring to take bath, especially the victims of different sorts of diseases. And by taking bath in the hot spring, it can heals different kinds of diseases like Tuberculosis, sinus, body-ache etc'. Sangey Tashey in a very recent blog mentions that due to a new road it's only a 2-3 hour walk. More recent info from this BBS report on Dunmang. Cassie made a bhutanese mans day when he walked in front of the window'. Sir, I seek your permission to use your picture "Lhaden in the Hot Spring" on my blog. I will acknowledge the source on my blog by keeping the link to your blog as well as mention the name of the photographer with link to his profile. I am a blogger from Bhutan. It's not for me to give permission. Follow the link below the photo to the original photographer and ask him.